There is so much nutrition information out there, its hard to know what to do. Having struggled with extra weight for years, we were forced to research the best plan to lose fat and gain muscle. The body can not build muscle and lose fat at the same time. The exception to this, is when you are first starting a workout program, or if you are taking steroids. Reducing calories and increasing exercise will work to burn fat, but after a while your metabolism regulates and stabilizes and your results will plateau. If you keep eating less and exercising a lot, you may continue to lose weight, but your body will start to steal muscle to make up for being in a calorie deficit. So, just like with strength training, we must program and shift your nutrition in phases, to continue to see fat loss and muscle gains, in the same program. You must eat carbohydrates and starches. This is what fuels the body. Taking them out of your diet can be beneficial at times, but it is not sustainable. Muscles need carbs to grow and they give you energy to workout. Increased muscle will also in turn, help increase your metabolic rate through out the day. Extra muscle can burn an extra 2-400 calories a day. In order to lose fat and gain lean muscle, you must lift weights and eat the right foods, cycled at the right intervals. by changing your daily habits and the quality of your food. We advocate eating whole unprocessed foods for most of your diet. We focus on keeping added sugar low, and increasing healthy starches and fats. Combining this plan with the proper exercise plan, you are sure to push through any plateau. 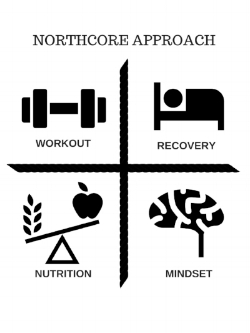 We will be adjusting the workouts you do at Northcore to coincide with the nutrition phases, to optimize your results. This Is False, and Will Actually Hurt You. Eat whole, healthy, flavorful foods. Make your own healthy meals. Water: Drink 1/2 body weight in pounds, into ounces of water. Sleep: 7-8 hours of restful sleep. In This Phase we want you to start making better food choices. Every person is unique and may be starting from a different place. You could be vegan, paleo, have allergies, be addicted to sugar or fast food, etc. to lose fat, gain muscle, and gain energy. We want you to eat more whole foods and conscience of what you are putting in your body. when you cook more meals at home, you have more control, of what goes in. Snacks: If needed, add between meals. Snack Ideas: Nuts, nut butters, smoothie, Veggies, apples, berries. Schedule: Try to have a 12 hour window between dinner and breakfast. Now that you have a handle on carbohydrate intake and portion sizes, we can take the next step. Food choices remain the same, but we will adjust the portions of carbs / protein on some days. Restricting Carbohydrates (starch), for prolonged periods, puts the body into chronic stress. Chronic stress tells the body to increase hunger & cravings, and slow metabolism. It wants to preserve fat stores for survival. This ultimately leads to decreased results and metabolism fatigue. Do this too many times, and it becomes more and more difficult for your body to function properly. - Your metabolism can only effectively do one of these at a time. - That is why we must go through phases, promoting one or the other. 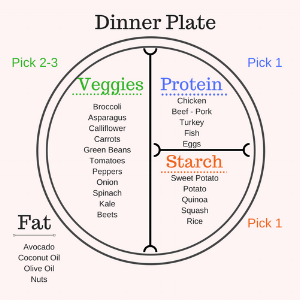 - In phase 2, we will be learning what it means to have a low starch (carb) day. - Eventually, once you hit your desired shape/size, this will become the maintenance phase. 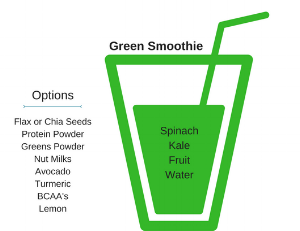 Continue with all new habits and food choices from Phase 1. On Workout Days - keep portions same as Phase 1. Follow These stradegies in order. Bone Broth: Great source of minerals & collagen, heals gut lining and reduces inflammation. Probiotic: We recommend getting a Women's Formula. Recovery On Off Days: Walk, Epsom salt bath, foam roll, activation exercises, meditate, yoga. Eat more when you need it. Live a healthy sustainable lifestyle. Similar to Phase 2, with more awareness of when and what to eat. It is important to remember that everything in the body works together and comes into account. When it comes to losing or gaining weight, the stress put on the body can not out shine the adaptation. Rest and Recovery are very important. Try to decrease stress in your life.